The main reason why Fuego’s eruption was more deadly than the Kilauea’s one is the type of activity. They are different types of volcanoes with different eruptive dynamics and thus different related hazards. Kilauea is a shield volcano and it is formed by a sequence of eruptions of very low viscous magma. The magma reaches the surface and is generally erupted in an effusive way generating lava flows, really hot mixtures of molten rock, crystals and gas emitted from the volcanic vent, able to reach several meters per second and kilometers of length, literally looking like rivers (such as in this video). These lava flows can be sometimes accompanied by weak to mild explosive activity in the form of lava fountains. On the other hand, Fuego is composed by successive eruptions of a more viscous magma than Kilauea’s. The higher magma viscosity is the key to understand the big difference between the types of activity of these volcanoes. Magma viscosity controls the efficiency of magma degassing, the process through which magma releases its exsolved gases in the atmosphere. A higher viscosity makes it more difficult for degassing to happen, causing the magma to retain the gas that is naturally exsolved. When the gas is not free to escape, it builds up the pressure in the system that eventually explodes, just like if you shake a bottle of soda and suddenly open the cap! When the volcano explodes, it can produce impressive eruptive columns of gas and particles that can partially collapse, generating pyroclastic density currents (PDCs) that run fast downslope on the volcano flanks and can reach near communities (such as in this video) and bury them under a heavy blanket of volcanic ash (Figure 2). Figure 2. Satellite images of Fuego volcano and pyroclastic flow deposit. 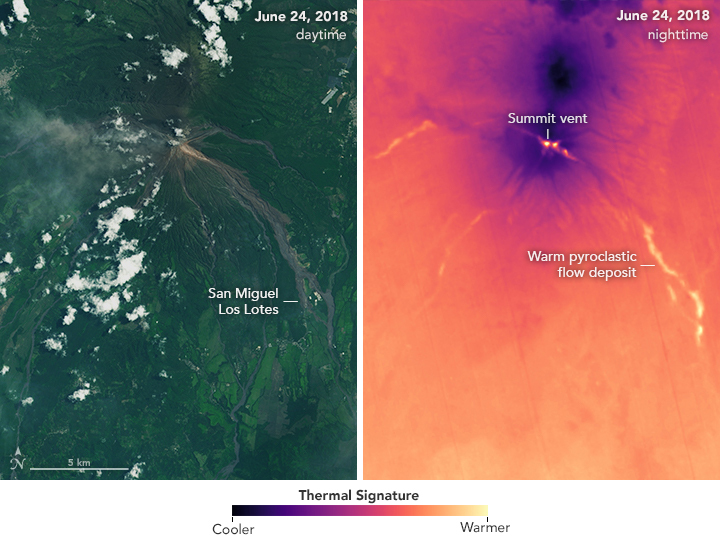 Daytime (left) image showing the location of San Miguel Los Lotes, one of the most affected areas, and nighttime thermal (right) image showing the relative high temperature of the pyroclastic flow. Image credit: NASA Earth Observatory. Image by Lauren Dauphin, using Landsat data from the U.S. Geological Survey. Caption by Adam Voiland, with information from Rüdiger Escobar-Wolf (Michigan Tech) and Janine Krippner (Concord University). The effusive or explosive behaviour of volcanic activity is responsible for a wide variability in the associated hazards (e.g. Figure 3). The dominant volcanic product and hazard in the Hawaiian case are lava flows, which are very difficult to stop or deviate, especially when the volcano is still emitting them. In the case of the volcano in Guatemala, the explosivity of the volcano makes the tephra fall and PDCs being the main hazards related. These last ones descended very fast from the volcano flanks reaching and covering entire villages in Guatemala in a matter of minutes. Figure 3. 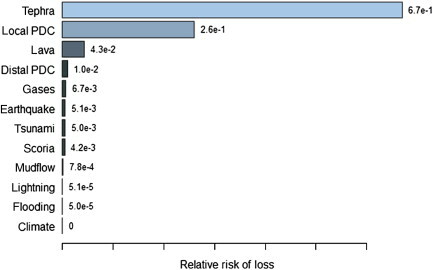 Normalized relative risk rankings by hazard for combined risk (humans and buildings) for Aukland, New Zealand (Magill and Blong, 2005). PDC=pyroclastic density current. The figure is taken from Aspinall and Blong (2015). What do we need in order to avoid a volcanic disaster? Even if the causes of the eruptions are still under the loupe, for most of the cases there are geochemical and geophysical signals, or precursors, that can be detected before the start of an eruption with a proper monitoring system. Here is where a good monitoring, warning and crisis management system play an important role. For the Kilauea’s case, the effusive nature of the eruption, a good monitoring system and an efficient evacuation plan of the affected area produced property and land loss only, while no human lives were taken. Instead, in the case of Fuego, the high explosivity coupled with poor monitoring and inefficient evacuation ended with several hundreds of deaths. Volcano monitoring provides scientific data that allow scientists to understand the dynamics of a volcano and it is a vital step to forecast an eruption onset and properly assess the related hazards, before giving a warning alarm (2). Then it is essential to have a functional monitoring system for a volcano that can affect population. A warning system gives decision-makers, and thus population, important information about the hazards posed by a volcano during the entire volcanic cycle, forecasting eruptive processes and vulnerabilities. This information can be used to plan the actions that have to be executed to protect the people (3). The crisis management is where scientists, decision-makers and communities work all together to mitigate the effects of an eruption. This is when a set of preparedness and response actions is developed and implemented (4). We must act at all levels to prevent large losses from natural disasters and this involves aspects of society such as politic and education. Natural hazards cannot be avoided, thus a good disaster plan is a key and it can be divided into four main parts: prevention, preparedness, response and recovery (Figure 4). It is essential to have a good risk assessment and have the society informed to reduce the vulnerability and hence volcanic risks. Figure 4. Physical and social manifestations and alert levels for two crisis timelines (Crisis A and Crisis B) associated with three different levels of magma and their associated precursors at the surface. The figure is taken from Gregg et al. (2015). People visiting and living in potentially affected areas must be educated about volcanic hazards and their effects as well as about how they can contribute to a better response to an eruption. Likewise, authorities (decision-makers) have the responsibility to mitigate the risks with ad hoc policies, manage the crisis and educate the population. This is an interplay of roles that we all must take into account as part of a society. Good hazard communication leads to social awareness, social awareness leads to disaster mitigation and loss prevention. (1) Magill, C.R., Blong, R.J., 2005. Volcanic risk ranking for Auckland, New Zealand. II. Hazard consequences and risk calculation. Bull. Volcanol. 67, 340-349. I am originally from Chile. I studied my BSc and MSc in Geology in Chile where I was always interested in natural hazards and communication between science and communities. During my masters, I focused on Volcanology and I am currently doing a PhD at the Ludwig-Maximilians-Universität (LMU) München, Germany, on that topic. My research is focused on experimentally understanding the response of shallow magma chambers under decompression and determine how eruptible they are. I joined the NhET in 2017 in order to collaborate and stay active in this important topic. I contribute to the Blog and capture the team events in videos and photos.